The Egyptian Society of Cardiothoracic Surgery which is the official responsable organization for the field of cardiothoracic surgery in Egypt. It was founded as a part of the Egyptian Society of Physicians in 1993, then as a separate society in 1996. It is concerned with education, research, training and spread of knowledge of cardiothoracic surgery in Egypt. 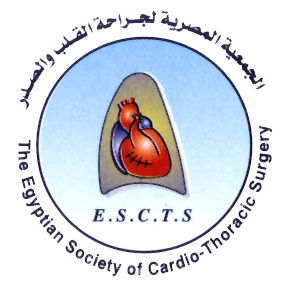 The Egyptian Society of Cardiothoracic Surgery (ESCTS) is dedicated to improving patient care by advancing the science and practice of Cardiothoracic Surgery. To encourage and promote excellence in Cardiothoracic Surgery education, research and practice. ESCTS envisions an environment in which every patient receives safe, efficacious, and high quality patient care. The society was established in Cairo as a part of the Egyptian Society of Physicians in 1993. The head office was in Dar Al Hekma. Then it was announced to be a separate society in 5/10/1996 carrying the official No. 346. The Cardiothoracic Surgeon (CTS) is an official publication of the Egyptian Society of Cardiothoracic Surgery that was founded in 1992. CTS the continuation of "the Journal of the Egyptian Society of Cardio-thoracic surgery" (JESCTS); ISSN: 1110-578X; 1995-2018. The first issue of ECTS journal was published in 1994. It was first called The Bulletin of the Egyptian Society of Cardio-Thoracic Surgery. Professor Hassouna M. Saba , FRCS was the first Editor (1994–1995). From January 1996, its name was changed to Journal of the Egyptian Society of Cardio-Thoracic Surgery (JESCTS) and started to have ISSN: 1110-578X. TheEditors of the Journal were respectively: Mohamed S. El-Feky, MD (1995–2004). Ezzeldin A. Mostafa, MD (2004–2008),Yasser M. Hegazy, MD (2008–2011), Mohamed AbdelraoufKhalil, MD (2011–2018), Khaled Karara, MD, executive deputy editor (2015–2018) and Ahmed Hassouna, MD (2018 till now). From January 2016 it had Elsevier as its international publisher following the standards of editorial process and publication. By the end of 2018 its name was changed again to Cardiothoracic Surgeon (CTS). Another Journal of the society was also started by that time carrying the name Egyptian Cardiothoracic Surgeon (ECTS). It was founded by Prof Khaled Karara in 2012. He continued to be its Editor till 2018. Prof Mohamed Amr started to be its Editor from 2018 till now. President: Prof Mohamed Anwer Ibrahim Balba. General Secretary: Prof Hussein Mohamed Gafaar. Treasurer: Prof Sameih Ahmed Abd Elrahman Amer. Treasurer: Ibrahim Badawy Ibrahim Haggag. President: Prof Hussein Mohamed Gafaar. General Secretary: Prof Sherif Abd Elhady Mostafa. President: Prof Sherif Abd Elhady Mostafa. General Secretary: Prof Sameih Ahmed Abd Elrahman Amer. Treasurer: Prof Nasser Rasmy Hassan Rasmy, Prof Ahmed Baheig Hosny Elkerdany. President: Prof Sameih Ahmed Abd Elrahman Amer. General Secretary: Prof Mohamed Ezz Eldeen Abd Elraouf. President: Prof Mohamed Ezz Eldeen Abd Elraouf. General Secretary: Prof Samir Abdalla Hassan. President: Prof Ahmed Labib Ahmed Dokhan. Treasurer: Prof Ahmed Abd Elaziz Ibrahim. President: Prof Ezz Eldeen Abd Elrahman Mostafa. Treasurer: Prof Elhoseiny Elhoseiny Gamil. President: Prof Elhuseiny Elhuseiny Gamil. President: Prof Mohamed Mostafa Agha. President: Prof Shaban Abo Elela. Honorary Award: Prof Mohamed Fahmy Salem Elfiky, Prof Mostafa Ibrahim Ragheb. Honorary Award: Prof Abd Elkader Othman Hasan, Prof AbdElrahman Fahmy, Prof Abd Elkhalek Tharwat. Best Research: Dr.Akram Refaat Allam. President: Prof Mohamed Magdy Mostafa. Honorary Award: Prof. Hussein Mohamed Gafaar, Prof. Adel Abd Elaziz Ramadan. Best Research: Dr Hassan Mohamed Elnabawy Yousef. President: Prof. Mohamed Ezz Eldeen Abd Elraouf. Honorary Award: Prof. Ahmed Elkosheiry, Prof. Foad ZakiAbdalla, Prof Mohamed Fathey Elashkar. Best Research: Dr Osama Said Abd Elmoneim. President: Prof. Loutfy Mohamed Essa, Prof. Medhat Elgammal. Honorary Award: Prof. Hamdy Elsayed, Prof. Mohamed Ali Khalil, Prof Maher Shoeir, Prof Ahmed Reda Nasr. Best Research: Dr Mohamed Ahmed Helmy, Dr Ahmed BadrAhmed Helmy. President: Prof Samir Abdalla Hassan. Honorary Award: Prof Ismail Sallam, Prof Zakaria Masoud, Prof Fouad Gebaly Hussein. Best Research: Dr Hesham Abd Elfattah Zayed. Honorary Award: Prof. Mostafa Radwan, Prof. Mostafa Agha. Best Research: Dr Wahid Etman, Dr Tarek Salah Eldeen AbdallaRizk. Honorary Award: Prof. Mohammed Bassiouny, Prof SamirMahmoudy, Prof Mohamed Magdy Mostafa. Best Research: Dr Hani Hassan Elsayed. Organized by: Alazhar Faculty of Medicine. Best Research: Dr Mohamed Mostafa Ibrahim Abd Elaal. Honorary Award: Prof. Medhat Elgammal, Prof ShabaanAboElela . Best Research: Dr Montaser Elsawy Abd Elaziz. President: Prof Mohamed Abd Elraouf Khalil. Honorary Award: Prof Hamed El Akshar, Prof Hesham Zeitar, Prof. Khaled Mansour, Prof. Moghazy Tantawy, Dr Mohamed Elgarhy. Best Research: Dr Ahmed Abd Elaziz Ahmed Elshrkawy. Honorary Award: Alexandria: Prof Moneer Zeerban, Prof Sameer Keshk. Ain Shams: Prof Magdy Mostafa. Cairo: Prof Magdy Gomaa, Sameer Abd Alla, Prof Mahmoud Elbatawy. Mansoura: Prof Abed Mowafy. Alazhar: Mohamed Ezz EldeenAbd Elraouf. NHI: Prof Sherif Abd Elhady, Prof Mohamed Nasr. Zagazig: Prof Elrady Kamal. Assiout: Prof Mahmoud AbdElrahman, Prof Ali Abd Elwahab. Best Research:Dr Waleed Salah Abo Arab, Dr Tarek Ahmed Nosseir. President: Prof Nour Eldeen Noman Gewily.